A NIST exhibit at the Louisiana Purchase Exhibition included modified laboratory instruments (glass tubing) containing neon gas, similar to those below. When electricity was applied, the glass tubing lit up with a reddish glow. Although a Frenchman is credited with inventing the neon lamp and obtaining a patent, he did not display the technology in public until 1910. Today, the neon sign industry is worth more than $1 billion. Early in the century, American consumers lost millions of dollars because so many scales and other weighing and measuring devices were inaccurate. What's more, the states did little about it. NIST set about to change that. To get the states interested, Louis A. Fischer, chief of the Metrology Division, convened a group of state weights and measures officials in 1905. The meeting was attended by just 11 people. But Fischer persevered, and the group agreed to meet annually and work toward the adoption of uniform laws. The group evolved into the National Conference on Weights and Measures, which today has more than 3,000 participants. The orderly marketplace of the modern era is ensured by "traceability" to an international system of units. Worldwide uniformity is maintained by the International Bureau of Weights and Measures in France, which oversees a collaborative comparison and updating process under a diplomatic treaty involving 48 nations. U.S. standards are maintained by NIST, which provides calibrations and standards to the states. The states, which are legally responsible for enforcing the standards, check the weights and measures used by business and industry in manufacturing and packaging products, and in determining the quantities of goods sold by weight, measure, or count. Accuracy in the U.S. marketplace improved considerably over the century. 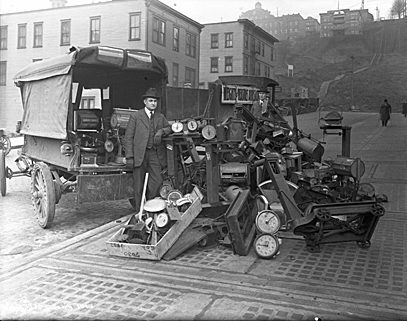 The photo above shows a test car used by NIST in 1913 to test railroad scales in the Northeast. Nationwide uniformity was enhanced further in 1978, when the Institute finished distributing physical standards for weights and measures to 53 states and territories. NIST continues to help the states by accrediting their standards labs, sponsoring the national conference, and providing test protocols and training. NIST also helps monitor fairness in the marketplace, collaborating with other agencies in studies of dairy product packaging, price-scanner accuracy, and other matters. Americans have learned a lot from NIST over the years, from how thermometers work to how to build a radio or conserve energy. The Institute's original consumer guide, Measurements for the Household, was published in 1915. The 149-page guide, based on data gathered in technical studies, described the operation of common measuring appliances such as thermometers and clocks. About 10,000 copies were distributed in three months, more than 30 times the usual circulation of Institute publications of that era. It was the first work of its kind. The journal Nature called it a "a treatise on domestic science," the first to demonstrate "the place of science in practical affairs." In 1917, NIST published Materials for the Household, which in both style and content anticipated familiar modern publications such as Consumer Reports. Another Institute guide, Safety for the Household, was first published in 1918 and showed, for example, the proper way to use a fire extinguisher. These three circulars had a great impact on the public; the Institute was besieged for years with requests for help with problems in the home. In 1922, NIST fueled the national radio craze when it issued a series of mimeographed letter circulars describing how to build radios. The first one described how to construct a simple crystal detector set for $10; it was so popular that two commercial publishers reprinted it. In 1923, the Institute issued How to Own Your Own Home, which sold 100,000 copies the first week. It was reprinted in magazines and serialized in newspapers nationwide. NIST continued publishing consumer reports through the late 1970s. Its most popular reports of the later era focused on smoke detectors and how to achieve cost-effective energy conservation in a particular home.